In most states, the ACT Test is given six times a school year, as shown in the tables below. The tests are administered on Saturdays. The regular registration deadline is approximately one month before the test date. Most high school students choose to take the ACT Test during the spring of their junior year and/or the fall of the senior year. Many student take the ACT test twice (once as a junior and once as a senior). 57% of repeat test takers increase their ACT composite score on a retest. The ACT Test Dates for the 2018-2019 testing season are shown below. *Not available in NY for February and July. Not available in CA for July. The projected ACT Test Dates for the 2019-2020 testing season are shown below. 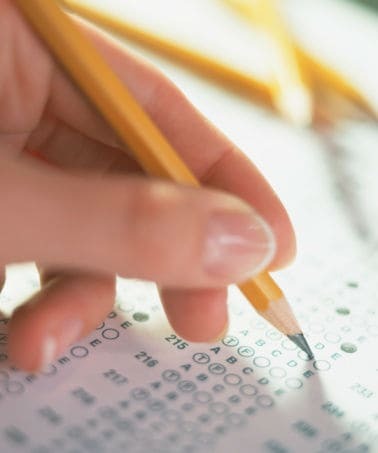 ACT Tests are given at local high schools, career schools, colleges and other locations. To find a test site in your area, go to http://actstudent.org/regist/centers.html. Tests are typically given on a Saturday. If you require a non-Saturday test because of religious reasons, there are a select number of test locations that can accommodate your needs. Please note that you will not be admitted to a non-Saturday test site unless you bring a letter from your cleric or a notarized statement that your religious beliefs prohibit taking the test on a Saturday. Typical High School students choose to take their ACT exam for the first time during their junior year. It is advised that you select a test date that is at least 2-3 months before the application deadlines of your preferred colleges and universities. You should also be aware of any deadlines for scholarships that you are pursuing. It normally takes between three and eight weeks after your test before your scores are reported. If you have taken the ACT Plus Writing exam, the reporting period is usually five to eight weeks after your test date. You will have completed most of the courses covered by the ACT. If you do not score as well on the ACT Test as you would like, you can retake the test in the fall of your senior year. You will be prepared for when colleges contact you during the summer before your senior year. You can use your test results to help plan what courses you want to take during your senior year. ACT Registration can be conveniently completed online. An advantage of online ACT registration is that you will know instantly whether your chosen test center has open availability. Additionally, you can print your ACT admission ticket. Beginning with the 2010-2011 testing year, online options were added for students with disabilities who choose to take the ACT at national test centers as well as for students who wish to test in a standby mode. ACT scores are given in each of the four tests (english, mathematics, reading and science). An ACT composite score is given as well. The ACT Scores will range from 1 to 36 and the ACT Composite score will be an average of the four subject area tests. In addition, you will be given subscores for the English, Mathematics and Reading subject area tests. The subscores range from 1 to 18 and do not necessarily add up to your subject area ACT scores. The subscores are intended to help you identify areas of strengths and weaknesses within the subject areas.